Exhausting bus drive from Nazca to Arequipa. 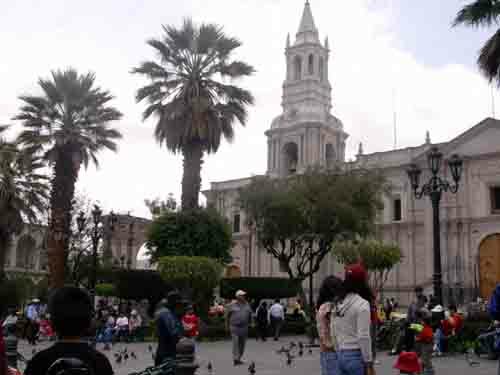 City tour Arequipa. Organizing our trip to Colca Canyon and the first part of this trip. Imagine, we made it. Our bus did not only arrive (almost) on time but did even get to Arequipa ahead of schedule. The bus was very new and in excellent condition, but it was only a „Semi-Cama“ (Half-Bed), that means that you can lean back the seat a bit and have something to lay your feet on. „Servicio Cama“ is much more comfortable, more like business class on long distance flights. I tried to sleep in many positions and the most comfortable position I could find was lying down in an empty row. From time to time someone hit my legs indicating that he would like to walk trough the aisle. After ten hours on a very winding road we arrived in Arequipa with hardly any sleep. Arriving at the hotel Ingrid and I were very tired and went to sleep for another couple of hours. 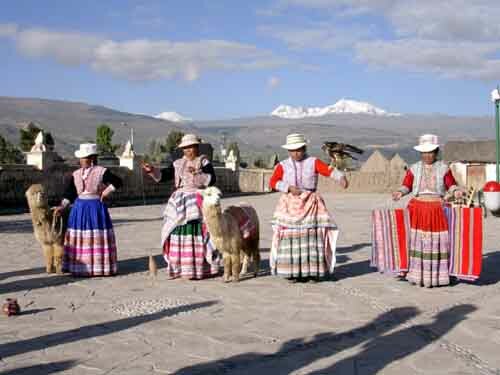 Arequipa lies at some 2,400 meters above sea level and is one of the oldest cities of Peru. It used to be a very important trading center for the Spanish colonies. 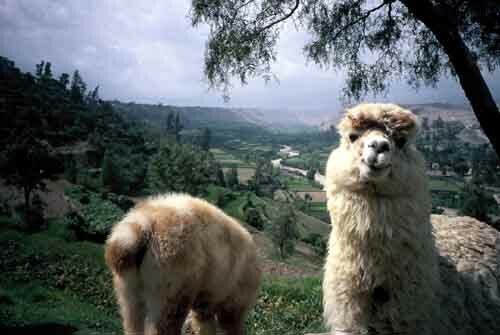 With over one million inhabitants it is probably still the second largest town of Peru. The cityscape is dominated by some white volcanic stone they used to build churches, palaces and many other buildings, therefore Arequipa is often called „The White City”. Once again we made a guided city tour which took us to some beautiful places. In Peru one Sol (about 30 US cents) is the standard price for many things e.g. this photo with a local boy and his baby llama. But most of the tourists do not come to Arequipa to see the city but to visit Colca Canyon, one of the deepest Canyons of the world, twice as deep as the Grand Canyon (though I have no idea how one defines the depth of a canyon). We went to different travel agencies to get information about possible tours and found that there are little differences between the tours of different agencies. The standard tour is a trip leaving Arequipa in the morning. On the way to Colca Valley you can see beautiful landscape and there a several stops to take photos. They enter Colca Valley at the very end (at the source of the Colca River) and lunch is in Chivay, the valley’s capitol with 4,000 inhabitants. Some tours include a little hike through the mountains and in the afternoon you visit hot volcanic springs. In the evening there is a show for tourists including traditional costumes and dances of the region. The night is also spent in Chivay. Very early next morning the bus leaves for „Cruz del Condor“ further down in the valley where there are good chances to see Condors. After half an hour or a little more, those tours return to Arequipa stopping at Chivay for lunch, some tours include an additional walk. The second tour which is frequently offered focuses on trekking through tiny villages and the mountains. THEY LEAVE AT 1:30 A.M. WITH A PUBLIC BUS! Therefore you probably spent a sleepless night on the bus before two days of hiking. We did not fancy the standard tour as it did not give us enough time to enjoy the nature. We did not fancy the trekking tour for obvious reasons. Taking a normal bus and to do everything on our own was not a good option as you can not stop in beautiful places to enjoy and take pictures. Renting a car would have been quite expensive as you need a 4×4, especially in case of rain. Anyway it is a good thing to have a guide to give explanations and to direct your attention to things easily missed. Local women in their traditional clothes. I’d really like to know how these strange hats became part of the costumes. We booked the standard tour and participated in the whole program but the show. 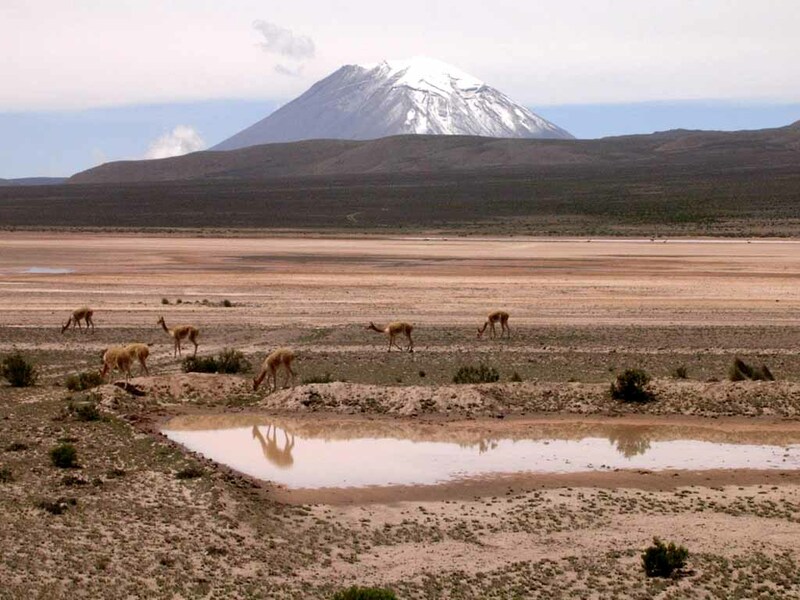 The highest point on the route to Chivay is at almost 4,000 meters, therefore the guides strongly recommend chewing Coca leaves to avoid altitude sickness. But they do not explain how to do it. Fortunately I am an expert in this field (compare my travelogue from La Paz). Rip off the stems of some leaves, staple the leaves, put a tiny bit of one of those substances on the leaves you need to make your salvia alkaline, fold the leaves and put them in your cheek. Effects: I did not notice anything but at least I did not get sick, neither from the altitude nor from the Coca.